Interim Provost and Executive Vice Chancellor Ken Burtis has appointed Michael Rios, associate professor of urban design and community planning, as faculty advisor to the provost to lead the development of a strategic plan for engaged scholarship and engaged learning. The strategic plan will build upon the vision articulated by a work group led by Dennis Pendleton, retired dean of UC Davis Extension, which in turn built upon the campus’s 2015 Community Engagement Classification from the Carnegie Foundation for the Advancement of Teaching, and laid out a broad vision of the value of engaged scholarship. Rios takes up his new position as UC Davis prepares to host a national initiative, Imagining America: Artists and Scholars in Public Life, dedicated to strengthening the arts, humanities and design in higher education with approaches that foster community partnerships, public scholarship and social equity. Imagining America moves its headquarters to UC Davis this summer. In his new role, Rios will lead a process of discernment to further characterize faculty and student interest in community engagement, at multiple scales and spanning the academic breadth of UC Davis, and then develop alternative models for supporting work in this arena. “Since our beginning as the University Farm, we have put our scholarship to work in the community — locally and around the state, and nationally and globally,” Burtis said. “In addition to disseminating faculty expertise, we have included elements of community engagement in the education of our students. A member of the faculty since 2007, Rios’ scholarship focuses on community engagement, place making, spatial governance, and the practice of planning and design. 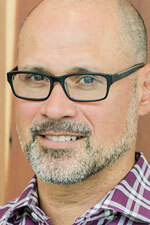 Rios is an active faculty member at the UC Davis Center for Regional Change, where he serves on the executive committee. He chaired the Community Development Graduate Group from 2011 to 2015. He holds a Bachelor of Arts degree in urban studies and architecture from Lehigh University, two master’s degrees from UC Berkeley (architecture and city planning) and a Ph.D. in geography from Pennsylvania State University. Rios’ efforts will begin with an inventory of the campus’s activities in engaged scholarship and engaged learning, seeking to characterize community engagement activities undertaken by the campus community. Concurrently, he will interview university and nonuniversity stakeholders to identify strengths, weaknesses, opportunities and challenges with respect to expanding the reach and impact of engaged scholarship. In particular, this process will also assess opportunities for students and faculty to become active in engaged scholarship and learning. The process will identify goals and objectives, and then develop organizational and resource models, including partnerships and possible alignment with existing or new entities (for example, Imagining America). All this data will feed into preliminary recommendations and then a draft strategic plan for wide dissemination with feedback solicited for consideration in the final plan. Rios anticipates having a draft plan for consultation in about one year.